This Electric Bike Went HOW Far? | Hupy and Abraham, S.C. This Electric Bike Went HOW Far? Everyone knows that records were made to be broken, and Berlin-based Remo Klawitter has done just that! Riding his Zero DSR electric motorcycle, Klawitter recently broke the record for longest distance traveled by an electric bike in 24 hours. “I’ve been thinking about a 24-hour ride since the middle of 2017,” Klawitter said. “Primarily, I wanted to have fun, while drawing people’s attention to the practicality of electric motorcycles.” In total, Klawitter traveled 1,134.3 kilometers – about 705 miles, over the span of roughly nine hours, with rest and recharge stops roughly every 90 miles. “Everything [I] have used is readily available from Zero, and the route was on public roads. In total, [I] spent 9 1/2 hours charging, and during this time, as well as resting and eating, I was able to speak to many people who were interested in the bike and the journey,” said Klawitter. 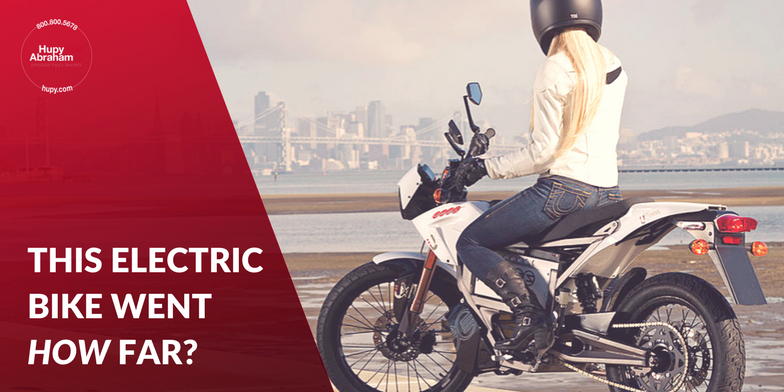 Though most would agree that electric motorcycle technology has a long way to go before replacing the world’s fossil fuel preference and practicality, the frequent advancements and broken records like Klawitter’s are an exciting step toward a more sustainable future! It doesn’t matter if your bike makes a rumble or a whir, at the law firm of Hupy and Abraham, we support your ride, AND safety. Get your FREE “Watch for Motorcycles” sticker here (compatible with all bike types!) to spread the motorcycle awareness message, and check our online motorcycle events calendar frequently to connect with riders near you!